Anti-pipeline signs greet visitors to Art Tanderup's farm near Neligh, Nebraska. 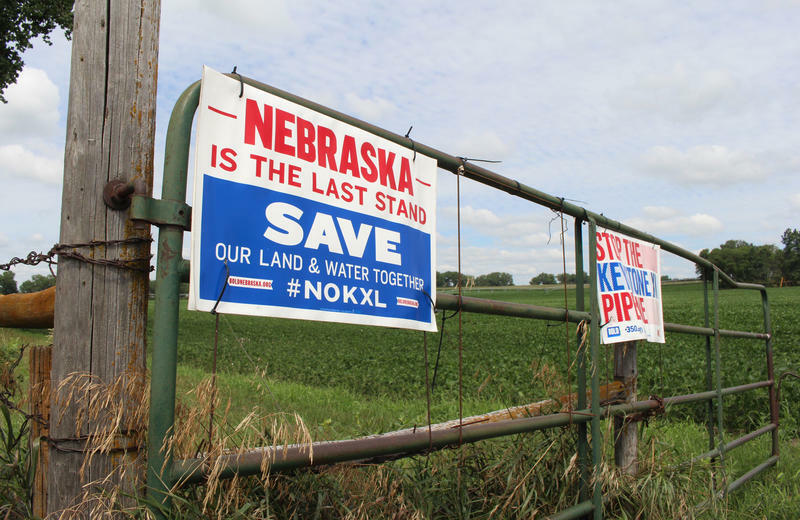 Landowners and environmental groups wanted Keystone XL out of the Nebraska Sandhills, a region with sandy soil that is quick to erode and hard to restore. However, many landowners have the same concerns along the current proposed route. They say their soil is too delicate for the disruption that comes with building a pipeline. The Sandhills are ancient, wind-blown sand dunes now mostly covered by grassland used for grazing cattle. 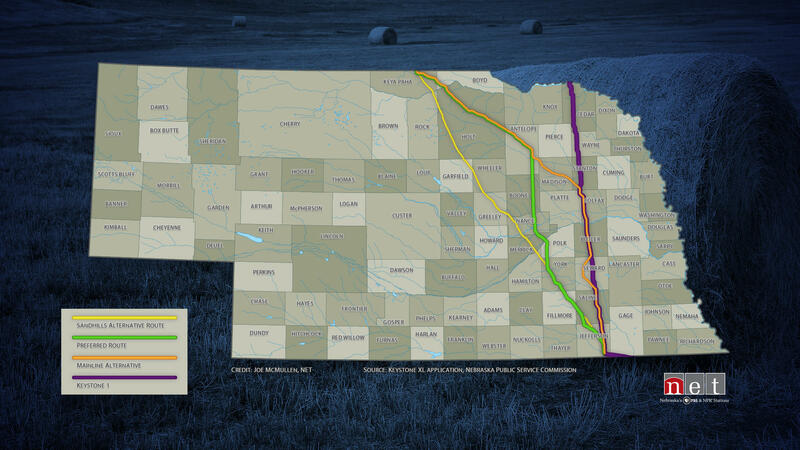 After Nebraska lawmakers pushed TransCanada to avoid the Sandhills, the company drafted a new route farther east. 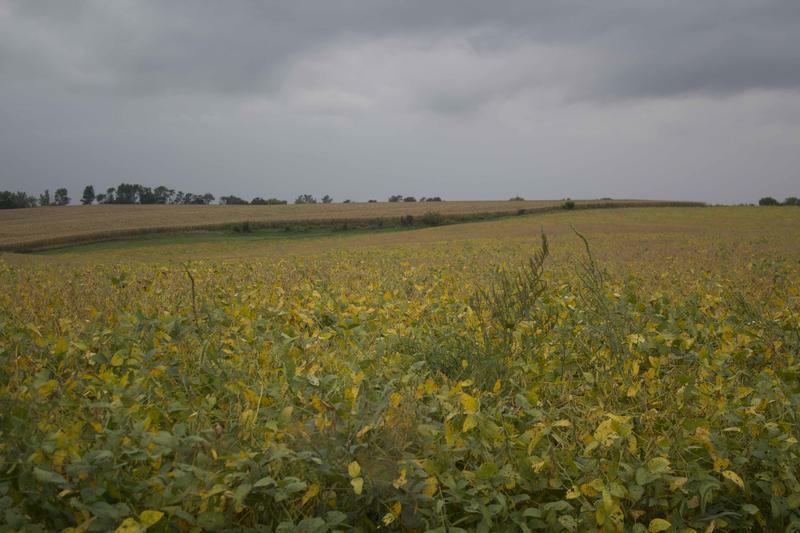 But Art and Helen Tanderup, who farm corn, soybeans and alfalfa along the current proposed path of Keystone XL, say the company did not move the pipeline far enough. The Keystone XL pipeline would pass through farmer Art Tanderup's property near Neligh, Nebraska. The Tanderups' farm near the town of Neligh in north-central Nebraska is surrounded by towering cottonwood trees planted a century ago by Helen’s grandfather. 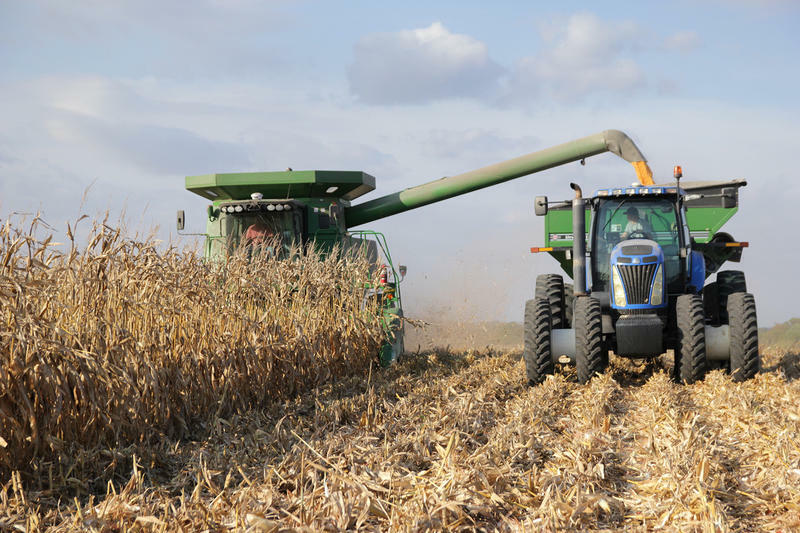 The couple has planted more trees on the edges of the farm and Art plants rye grass as a cover crop between plantings of corn and soybeans just to keep roots in the soil year-round. If he does not, he says, the soil might just blow away. Tanderup walks up the drift to grasp the stump of a post poking out of weeds growing in loose, sandy soil. If TransCanada comes through the Tanderups’ farm, the company will bulldoze the thin topsoil and dig a 7-foot trench to bury its pipes. The soil he works so hard to hold down will be exposed to the relentless wind. Even after the hole is filled in and the soil is put back in place, Tanderup says the crops planted there will struggle. TransCanada moved the pipeline to its current route based on a map made for the U.S. Environmental Protection Agency called Ecoregions of Nebraska and Kansas. Agencies like the EPA use it to help make land management decisions. The Nebraska Department of Environmental Quality adopted the map in 2011 to define the borders of the Sandhills. The resulting route by TransCanada winds a path nearly parallel to the edge of the Sandhills in north-central Nebraska before it turns south toward the Kansas border. As far as Tanderup is concerned, his farm in Antelope County is in the Sandhills, too. 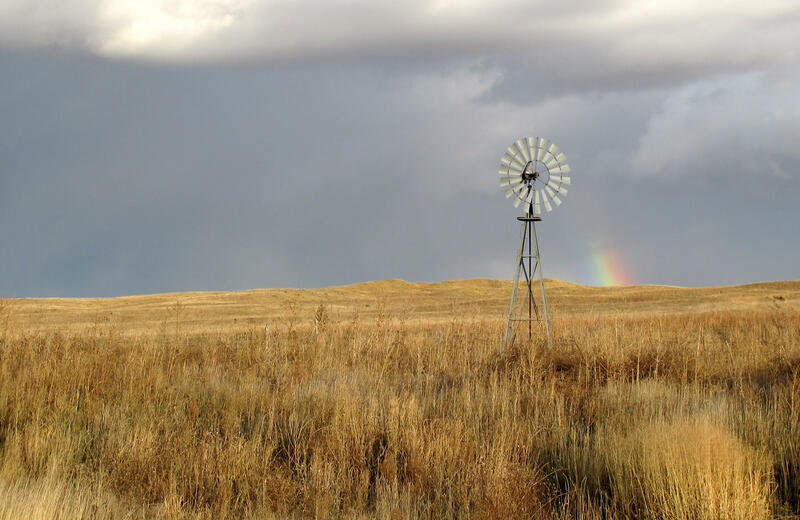 The Nebraska Sandhills are sand dunes covered by prairie grassland. Researchers at the University of Nebraska-Lincoln drafted a different map that outlines the region in the Atlas of the Sandhills. James Swinehart, a now retired geologist at UNL, says the boundary of the Sandhills can be hard to pin down on the eastern edge. The map he drew in the Atlas suggests that Art Tanderup’s farm is not within the borders of the Sandhills and neither is the pipeline. “The definition of the Sandhills, to me, a component has to be a wind-blown deposit (of sand),” Swinehart says. Wind-blown deposits of sand do not extend as far as the current route of Keystone XL. However, Swinehart says, the same sand that formed the dunes of the Sandhills also washed into some of the surrounding soil. While the soils may have been formed differently, there often is not much difference between the qualities of the soil in the Sandhills and the pockets of sandy soil nearby. “A sandy soil, whether it be in the Sandhills or outside the Sandhills, (will) have very similar properties if they’re in close proximity and they should be treated the same in management,” says Mark Kuzila, a retired soil scientist with UNL. When TransCanada built its first, smaller, Keystone pipeline in eastern Nebraska in 2009, the pipe went through soil that Kuzila says is much more resilient. Soil along that route is typically more fertile and holds more water than Art Tanderup’s sandy soil. One alternative for TransCanada is to build Keystone XL along the first Keystone pipeline in eastern Nebraska, in heavier soils. 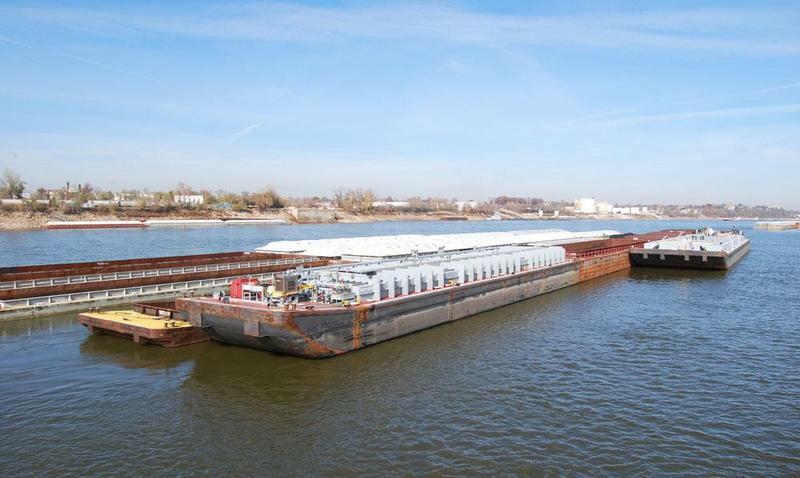 Taking that route would mean laying more miles of pipe, however, which would be more expensive and would also put more land in the pipeline’s path. The proposed route of the Keystone XL (in green) runs near the edge of the Sandhills before turning south toward a pipeline hub in Steele City, Nebraska. 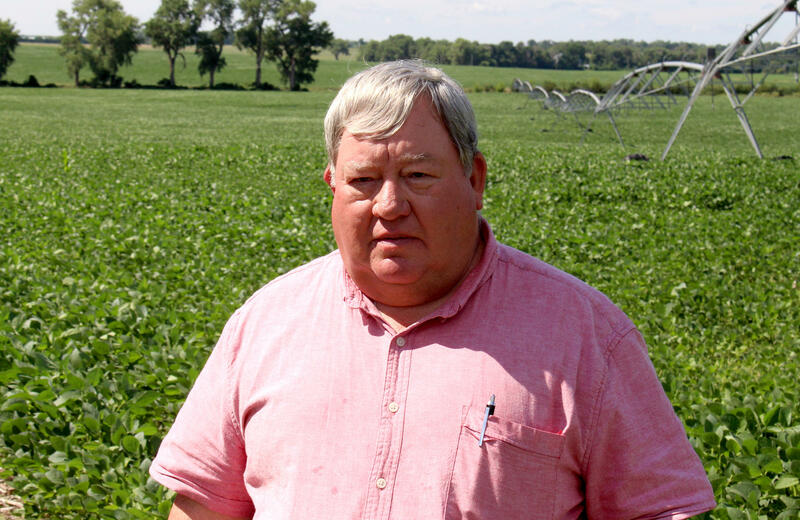 Farmer Art Tanderup says many of his neighbors have signed agreements with TransCanada to build on their property, should the Nebraska Public Service Commission approve a final route. He says he is one of about 20 landowners holding out in Antelope County. Erosion is just one reason he will not sign. Tanderup also worries that an oil spill could spoil the water supply that he drinks and uses to irrigate his crops, and he wants to see the U.S. push beyond fossil fuels. “We’re saddling up the horse and buggy here again when we should be looking forward to clean, renewable energies,” Tanderup says. The planned pipeline would run about 600 feet from his house. Regardless of whether the map calls it the Sandhills, he says that hits awfully close to home. 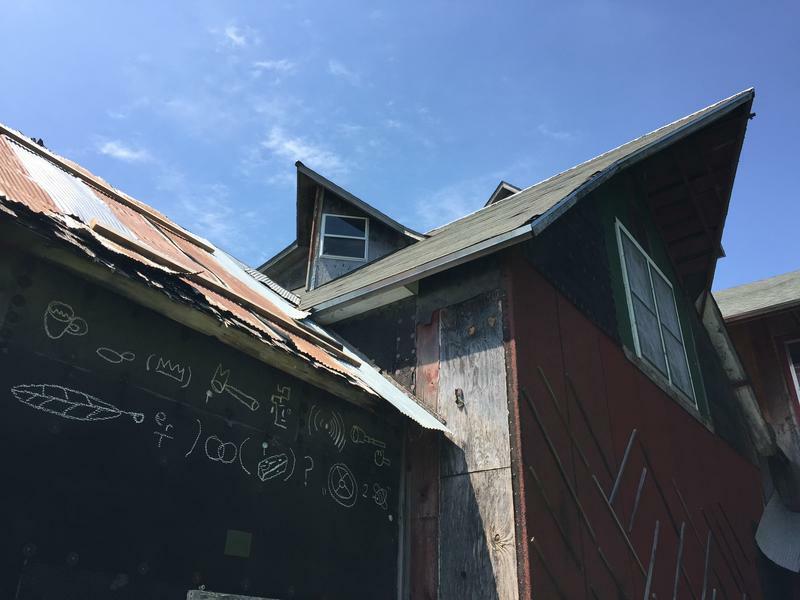 In the middle of a cornfield in south-central Nebraska, an oasis of art is growing. Art Farm, situated off a long dirt road outside the small town of Marquette, started back in 1993 as an artist residency program. Since then, it’s become a one-of-a-kind experience many artists can’t resist.